Longbow is a special kind of bow that used for hunting for a long time. You can claim yourself as a skilled archer then when you can shoot by a longbow. To accept this challenge and become a great hunter, first of all, you need the best longbow to practice or target shooting. As SAS pioneer traditional wood longbow is the best longbow for a beginner, you can choose it as your companion. You can feel the thrilling of instinctive shooting and accustomed with archer paradox if you buy a 68’’ long wooden bow from Southland Archery Supply. The SAS is a renowned bow maker presented some best bows among the archery lovers around the globe. SAS Pioneer Longbow will assure you highest performance and smooth shooting ever as well as the price is unbeatable. If you want to buy a longbow now click here or if you want to know more on it, please read our details SAS Pioneer longbow review below. 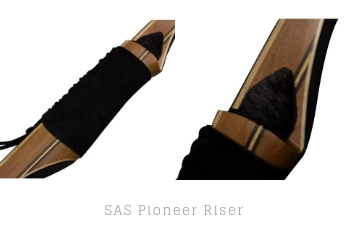 SAS Pioneer traditional wood longbow riser made of Makore and Cassia Siamea wood with fiberglass reinforcement. Where the Makore is rot resistant and Cassia is distinctly sturdy wood by nature, a combination of which is a rare to see in others longbow. Thus it makes a very stable and durable riser in a cheap price category. SAS longbow also includes arrow rest for off-the-shelf shooting. Moreover, SAS covers the arrow rest with fur padding for a smooth and accurate shot. The string also comes with a nocking point. The grip covered with leather which comfortable to fits all hand size. Once there was a situation like that the squeeze on your favorite bow was either too small or too big, the SAS Pioneer Longbow is thought-out to fit precisely in your hand, no matter its size as well as it also protects the bow and the arm during shooting. The limb crafted with a combination of Maple and fiberglass, making it's quite strong and durable enough to exaggeration from any abuse. SAS brings reinforce limbs tips which allows you to use Flemish or FastFlight string for accurate draw weight during hunting. which is perfect for a start by a beginner in the longbow archery. The lower poundage will assist you to shoot smooth in case if you are a low stature man. Usually, other available longbows started with high draw weights like 50 pounds or more. So, getting a longbow with a draw weight of 35# is pretty fantastic. SAS Pioneer Longbow is not a takedown bow which means you cannot change the limbs in future. So, If you have a solid Another most considerable advantages of SAS Pioneer Longbow is it comes up with a weigh as low as 35# experience in archery, then you may choose a bow of draw weight 40- 55 pounds. As I said, SAS longbow has a super performance. The bow is simple in design but complex in work as well the features performs their duties well. The power of the longbow depends entirely on its draw weight and the kinetic energy. You will feel a little hand shock when shooting with the SAS longbow compare to the other. Another crucial attribute of a longbow is accuracy. The SAS longbow has a centered arrow shelf which leads to accurate shooting from a distance. So, it is a pretty well bow regarding efficiency. Q: What is the draw length of SAS Pioneer? Ans: The draw length depends on individual height and draws weight. However, the maximum draw length of Pioneer longbow is 33 inches. Q: Is the SAS longbow includes arrow rest for off-the-shelf shooting? Ans: Yes! SAS includes the arrow rest that comes up with fur padding and the shelf cut to the center for smooth and accurate shooting. Q: Is it suitable for a left-handed person? Ans: No, it designed for right-handed people only. However, you have to hold with the left hand and shoot with the right hand. Q: Is it a hunting bow? Ans: Yes! If you are an expert archer, you can use 40# or above for hunting. Q: Is it includes armguard to protect your arm? Ans: Armguard is necessary during shooting as the arrows fly nearly to your arm. Yes, SAS includes an arm-guard in its package. Solution: as the limb tips reinforced so you can change the existing with another good one like Flemish or FastFlight. Solution: it is a matter of sorrow for lefties. However, they can choose other longbows in the market like Toparchery. Longbowmaker longbow is another fantastic addition to longbow history. If you want a bit wider draw weight (20 to 110 lbs. ), you can choose it. Longbowmaker is also using Macor wood to construct their riser as like Southland Archery. If you consider the quality both the bow is identical, but the length of SAS pioneer (bow length 68’’) is little higher than the Hungarian. Finally, I can say that the SAS Pioneer Traditional Wood Longbow is one of the most affordable and attractive bows you have ever seen. The beginners can enjoy it; seasoned archer finds fun during hunting game with it. Powerful shooting, accuracy, and sturdy design are the life’s mysteries of the bow. We highly recommended to this awesome traditional look modern longbow and enjoyed your time.